My head has been spinning for two weeks. Justin and I made a tentative decision to move home to Kentucky earlier this year. Then, when his mom passed away, we decided that we really needed to be closer to home. It all seemed so distant then. But now, well, it’s now. All of a sudden, there are some things that we will never do again. 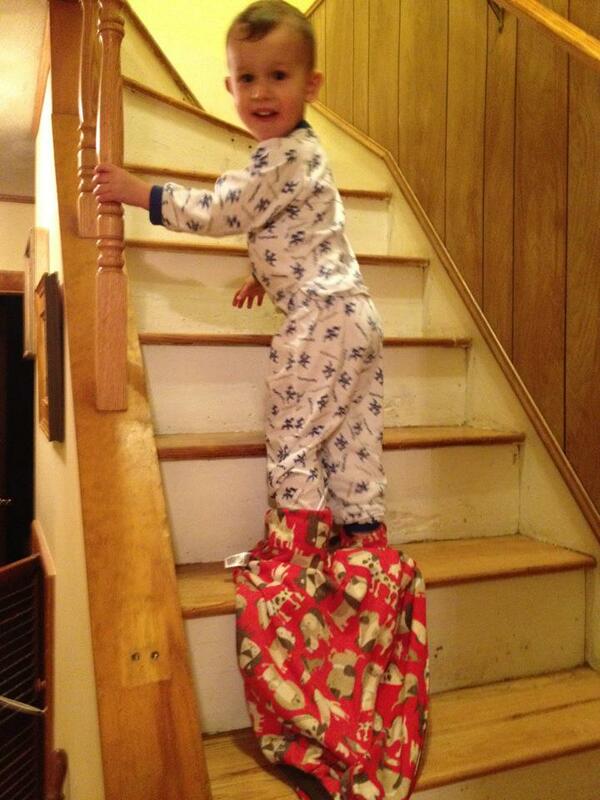 We will never have a Christmas tree in this house again. I will never get a chance to host a Thanksgiving dinner (I had surgery a week before my first opportunity and had to order the meal from the grocery). Robbie will probably not have another birthday party here. But these are all fairly distant. It really hit me two weeks ago, as we prepared to go to Kentucky. I looked at Robbie, Justin, and Barkley playing on the bed and, suddenly, it was all I could do to hold back the tears. They would never do that again in Boston. And I will never run with him in the mornings here again. Slowly, over the past week, our animals have gone to live in different places. Barkley and Grover stayed in Kentucky with my mom, waiting for us to move. Elmo was shipped to a student’s house, waiting for us to sell the house. Oscar and Cookie Monster remain, both panicked that they are next. Justin and I went house shopping while we were in Kentucky. Of course, we fell in love with the third house we visited. Now we just have to sell our house, which goes on the market Thursday. And, with that, we are off on the adventure of a life time. Robbie got his Valentine’s Day present a day early – mostly because I came home to flowers from my two favorite guys and couldn’t hold out on them until tomorrow. And he was so excited to see that they were tub toys. 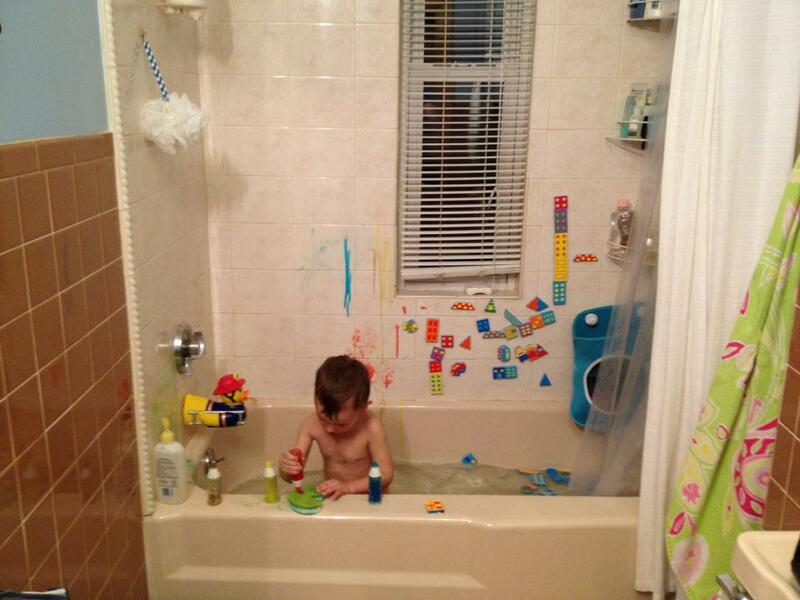 In fact, he totally skipped dinner to play in the tub. For over an hour. Initially, Robbie wasn’t sure what to think about the tub paints. That didn’t last long. Within minutes, most of the walls were covered with the soapy paint goodness. A few minutes later, and he had a city built on the walls. He played in the tub like this for over an hour. By the time he finished, the water was ice cold. But, he’d built an entire city and spent time telling us everything that Mommy, Daddy, and QiQi were doing. He included Daddy’s car (and QiQi’s car seat), Nemo, and a spaceship that goes to the moon. He pointed out triangles, boxes, and a rhombus (which was actually a trapezoid, but, hey, I teach English, not math). Justin and I peeked in a few minutes later to discover that Robbie was cleaning up. Every piece of the village was put in the mesh bag, and he was attaching the painted tile with a washcloth. I said, “Thanks for cleaning the tub, Rob!” Without even looking up, he muttered, “Welcome, Mom. That’s better. All clean.” And it was. Robbie learned an important life lesson this afternoon. When Mom tells you to hold on to your balloon, you better hold on to your balloon. Justin and I had finally managed to get Robbie out to door to go to the mall (you know, to get the three keys that had mysteriously disappeared from our keyboard replaced). Before we knew it, Robbie dashed back inside to grab his Chuck E. balloon. Justin grabbed it at the top to make sure it didn’t fly away, which upset Robbie greatly. Unfortunately, they both let go of the balloon at the same time. And they were outside. Robbie cried a little as he watched the inflated rat head float away, getting stuck for a moment in the tree in our front yard. He kept trying to jump to get it, and then turned to me, begging me to please jump. He was just so sure that I would be able to reach it if only I tried. And then, thirty seconds later, the balloon was gone. Completely out of sight. I’m pretty sure he thought we were getting into the car to chase the balloon but was moderately soothed when we promised to get a new one if he was good at the mall. True to our word, on the way out of the mall, Justin and I stopped at the balloon kiosk (yes, there is such a thing) and purchased a Buzz Lightyear balloon. A Robbie-sized Buzz Lightyear balloon. Complete with short “leash” for him to walk along side the stroller. The entire way to the car, Robbie talked to Buzz, even encouraging him to hurry up. Before heading home, we stopped at the store across the street to pick up some necessities, namely tortilla chips and orange juice. Robbie talked to Buzz about items on the shelf, reorganized the tomato sauce, and grabbed a galloon of orange juice for us to take home. And then he and Buzz went for a little run, up and down and up the aisles of the store, Robbie yelling, “Come on, Buzz! Let’s go!” the whole time, making sure to hold on tight to his new friend. Justin finally got back to Boston tonight after a long week of traveling. We had planned to have an intimate dinner together at Salvatore’s while Robbie played upstairs at Imajine That. Unfortunately, there were no openings for Robbie… So, Justin and I did what we do best; we improvised with a family date to Chuck E. Cheese. Robbie was a big fan of the pretend tea cups, which was actually a cup of hot chocolate with dancing marshmallows. He would come to the table, get a sip of lemonade, a bite of pizza, and a token before running to climb into the mug. He slid his token into the slot and sat back in the seat. As he started to spin, he waved, shouting, “Hey, Mom! Hey, Dad!” with a huge grin on his face. And then, when the ride stopped, he would repeat the whole process. At the end of the night, Robbie earned a few pieces of candy and a nice ball. And the requisite balloon. On our way out the door, he gave me a big hug and kiss and said, “Fun family date, Mom.” It’s definitely not the Friday night I envisioned, but it was pretty fabulous nonetheless. You know my child is a little crazy. Happy birthday party hats. Stuffed animals going to church. Balloons. Well, last week, we hit a new one. Jammies. When I was getting Robbie ready for bed the other night, he enthusiastically proclaimed that he wanted to wear his Go Cats jammies. He was already in a diaper and sliding right into his Go Cats shirt when he spotted it. His Barkley jammies (you know, red footies covered with different dogs). He had to put them on right away, over his Go Cats shirt. Of course… And just as we got the footies on, Robbie spied the Go Cats pants and insisted on wearing both of them. This lasted for about an hour, until I was paged upstairs with promises that he had to potty. As I walked through the door, I was greeted with Robbe unzipped in his footies and trying to figure out how to get it off to get ready for the potty. After a little awkward maneuvering, he was ready to use the potty. I left him to his business (we’re working on the concept of privacy) and headed back downstairs. And, yes, he did sleep in two pairs of pajamas, proving me wrong when I promised that he would get too hot in the middle of the night.